This is major surgery requiring a general anaesthetic. 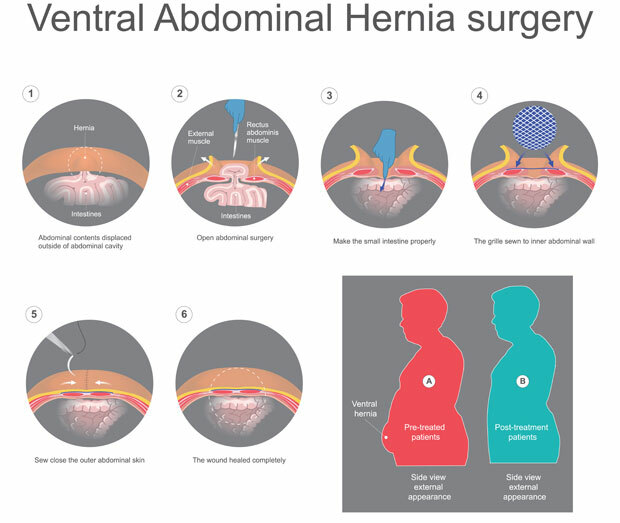 Most commonly a complex hernia repair is required in patients that have undergone previous major surgery through a big incision in the middle of the abdomen, in cases where the abdomen was left open after lifesaving surgery and only the skin covers the bowel, in cases where the abdominal muscles have been injured after trauma or a hernia has developed next to a stoma. This results in a big defect (incisional hernia) in the middle of the abdomen or next to the stoma with the muscle layers being far apart with a significant amount of bowel protruding through the defect. Prior to the operation sometimes injection of Botox into the muscle layers on the sides of the abdominal wall may be required to lengthen the available muscle layers to enable closure of the abdominal wall. On the day of surgery, in order to repair this type of hernia a surgical cut is made in the middle of the abdomen over the previous scar and the different muscle layers of the abdominal wall are released (component separation) using various techniques in order to close the defect in the middle. A minimally invasive technique called endoscopic release is usually employed in order to avoid undermining of the abdominal wall fat layer and reduce pain after surgery. Sometimes entry into the abdominal cavity is required to complete the repair. A synthetic mesh is then fixed in place to support the closure of the hernia in the abdominal wall. Drains are left within the cavity in the abdominal wall to prevent the build up of fluid. These are removed after a few days. After the procedure you will wake up in a hospital room. After the repair of a complex hernia you will need to spend a few nights in hospital. You are typically expected to go home once you are eating and drinking, are able to manage the pain and walk unaided and have passed some urine. It normally takes about six to eight weeks to fully recover from a complex hernia repair and return back to work but it varies from person to person and depends on their general health and the nature of their work. You should avoid any heavy object lifting or strenuous exercise for at least 2 months to reduce the risk of the hernia coming back. Complications in relation to a complex hernia repair include those common to all major surgical abdominal procedures such as infection, bleeding, blood clots, heart problems, pneumonia, urinary retention, risk of injury to intra-abdominal organs, anaesthetic risks and complications specific to this operation such as risk of a fluid collection (seroma), hernia recurrence, chronic pain and mesh infection.